With this kit, proper care of your vinyl convertible top is easy! It will save you money and add years to the life of your convertible top. 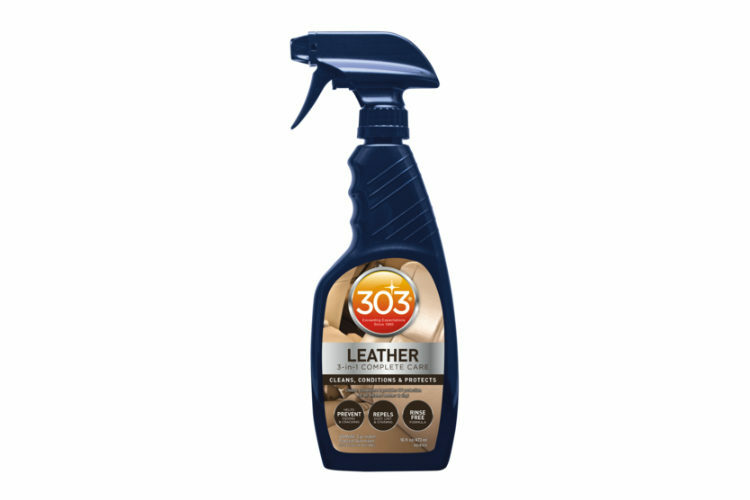 This kit contains both 303 Tonneau Cover AND Convertible Top Cleaner, to help remove stains, dirt and debris, and 303 Protectant to provide superior protection against harmful UV rays. 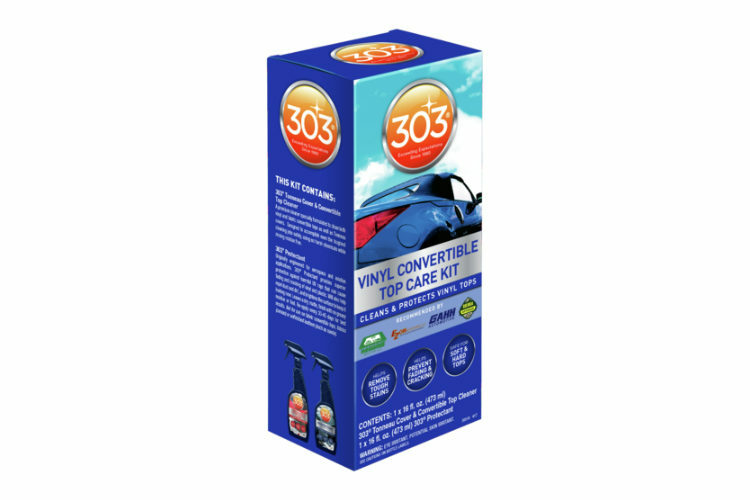 303® Vinyl Convertible Top Care Kit is rated 4.9 out of 5 by 7. Rated 5 out of 5 by RC1939 from Vinyl Top Cleaner & Protectant The top on my Woodie was the victim on the "BIRDS". I used this product, cleaner first & then protectant & that was all there was to it. 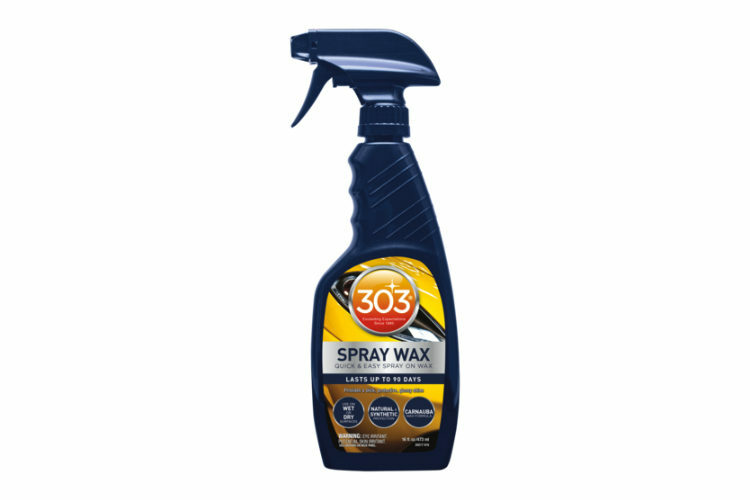 Rated 5 out of 5 by phantom gray from another quality 303 product i've been using 303 Protectant on my cars for many years and have been very happy with its performance. after being provided with a free sample of the Vinyl Convertible Top Care Kit i was not at all surprised to find it to be an excellent product as well. the Cleaner cleans exceptionally well (i do recommmend getting a quality convertible top brush specific to the job) and the 303 Protectant works just as nicely on the top as it does elesewhere throughout the car. definitely recommend! Rated 5 out of 5 by racerrandy from Exactly What I Needed I used 303 Vinyl Convertible Top Care Kit not on a convertible top, but on a piece of vinyl covered outdoor furniture. The furniture is left outside, uncovered on a patio and exposed to sun most of the day. The 303 Convertible Top Cleaner worked wonders on the vinyl surface and 303 Protectant helps prevent cracking and fading. 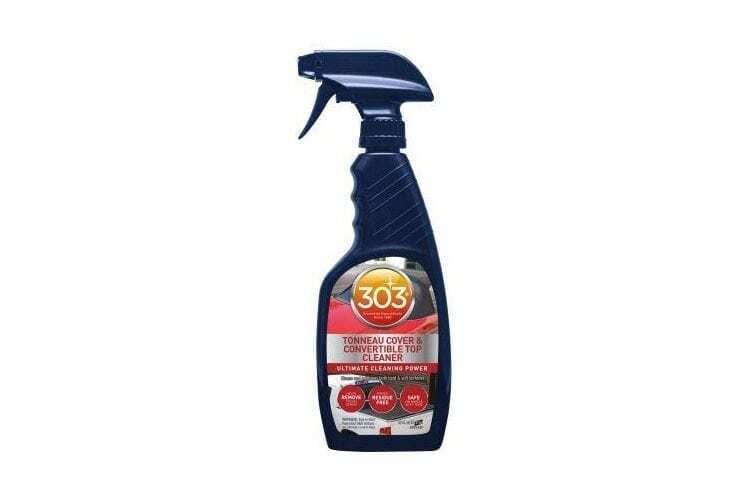 If 303 Vinyl Convertible Top Care Kit works this well on my vinyl patio furniture, just think how well it will work on your convertible top! Rated 5 out of 5 by Captain Rick from Works Great I used this on my Jeep's Vinyl BesTop. The exterior had your usual dirt and stains (from birds mainly). The interior was equally as dirty since I doubt it had ever been cleaned. Followed the cleaning directions and it came out looking great. All the stains were completely gone. After adding the Protectant - it looks like brand new. Another quality 303 product. Rated 5 out of 5 by Alabama kid from Good stuff I bought an 1980 MGB. That had been setting in a shed for years. The top was in got shape, but it looked old. I thought I would just replace it, but tried 303 convertible top care kit first. Glad I did the top look great now, no need to replace it.